"...Written by skilled playwright Jason Karasev and directed by Michael Peretzian, DEATH HOUSE is a play you don't want to miss. Gripping, poignant, exciting, enigmatic, intriguing, startling, fascinating. All of these descriptors and more mark the Road Theatre on Lankershim's latest must-see production." "...What starts off as a capital punishment-vs.-life imprisonment debate develops into something considerably deeper and more powerful in Jason Karasev's profoundly moving Death House, a Road Theatre Company World Premiere." 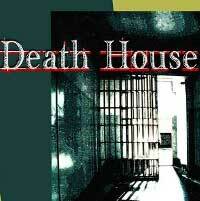 "...Death House is a room, the last stopover for criminals awaiting execution. To make their last hours as comfortable as possible, a chaplain stays with them. George has had this duty for 22 years, but tonight he is training his replacement, a brash young preacher named Allen. The first act of the play deals with their meeting and the conflict of their beliefs." "...It all adds up to a shattering experience. You go on a journey with George, Allen, and Liliana, and though there are no easy answers or happy endings, it's a journey you'll be glad you took." "...The performances are instinctive and shocking, and unflinchingly real. I'm not ashamed to say that I wept and that each of these brilliant actors on stage made me do so copiously at several different moments. " "...Beginning with Sam Anderson's well-conceived pastor, the characters in Karasov's flawless play build tension personally as well as philosophically. Even as Allen's cocky demeanor attempts to cover up his own pain, Liliana's matter-of-fact acceptance of her fate hides a lifetime of ill treatment. That we can sympathize with each person makes Death House a perfect proving ground for a dispassionate assessment of our current laws." "...I have to emphasize, once again, that this play is remarkable for its verbal exchanges and for the way the three magnificent actors bring it to life. It's a production that ought to be seen by everyone, no matter which side of the death penalty issue they espouse." "...Death House is not a perfect play, but it packs a wallop. Some of the plot twists are awkward, and the first act has too much padding. Michael Peretzian does a fine job of directing, and he draws solid, convincing performances from his cast. Derrick McDaniel provides a highly effective lighting schema."